The Michigan Wolverines defeated the UNLV Rebels 28-7 today to improve their record to 2-1. UNLV dropped to 0-3 after the loss. The Wolverines opened up the scoring early in the first quarter on a pass from Jake Rudock to running back DeVeon Smith. The Wolverines did not look back from then on as they kept the offensive pressure on, scoring two more times in the first half, both on running plays. A 36-yard run from Jehu Chesson, and a 76-yad run from Ty Isaac. "It was a fantastic run by Ty Isaac, we didn't block it right, not the way we drew it up, missed a block and I thought it would be a tackle for a loss," said head coach Jim Harbaugh after the game. Luckily for the Wolverines it went 76 yards, rather than a loss. Isaac led the Wolverines in rushing on the day, rushing eight times for 114 yards and a touchdown. Starting running back, Smith struggled to find holes carrying the ball 13 times for 33 yards. Jake Rudock finished the game 14 of 22 passing for 123 yards, with one touchdown and one interception. So far through three games the Wolverine running backs have not lost a fumble. "I'm pleased with the way our team played, they did what was asked, that was to take care of business," said Harbaugh after the game. "We are going to keep striving to get better in every area." The Wolverine offense struggled with the downfield passing game for the third consecutive game this season. Rudock missed multiple wide open receivers, and even struggled to find his check down at times. Wilton Speight relieved Rudock for the final offensive drive of the game and despite not completing a pass looked able to kickstart a downfield passing game showing excellent arm strength. 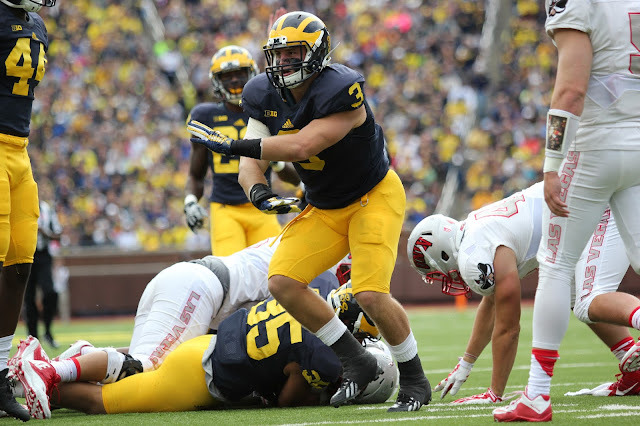 The Michigan defense continued to impress, forcing two interceptions on the day. Channing Stribling and Jeremy Clark had the interceptions on the day, while Joe Bolden led the defense in tackles with six. Chris Wormley also continued his hot start by forcing a fumble. The Wolverines will taking on the BYU Cougars next week at home, another noon start.